MsClawdia wrote X-Files fanfic (under a different handle) back in the stone age when she also used to drink straight vodka. Now she is a working woman with a teeny infant, a husband, a hound, and a big Spuffy crush. Summary: Set some time between Normal Again and Hell's Bells. A lighter story. Two Buffies find themselves tossed into each other's worlds and have to deal with each other's lives until they can find a way home. 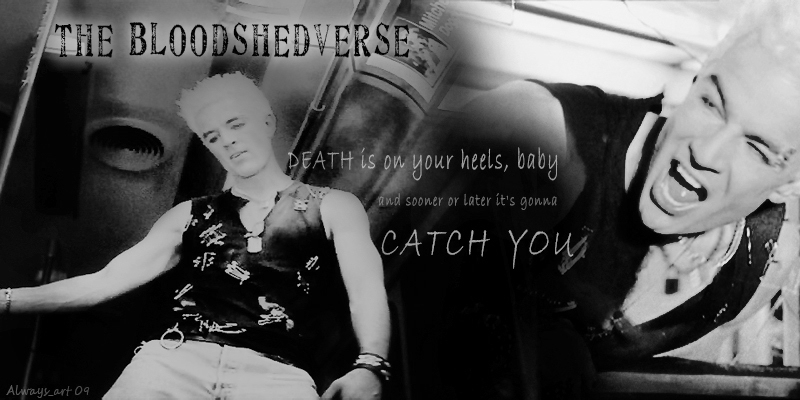 Written for Liliaeth's challenge, number 29, on the spuffy_haven lj community. post-NFA, Buffy and Spike have settled into a comfortable cohabitation. However, when they get tossed back through time into the New York of ’77, they are confronted with the reality of Spike’s uncomfortable past. It has been about thirty years since Buffy jumped off a tower to save the world. Her world and her friends have changed in her absence. Not knowing how or why she's back, Buffy still has to find a way to become one of the living again. R for now, probably NC-17 or hard R later. Summary: Buffy’s already got the blues, and then various incarnations of Spike start mysteriously popping up all over her house. It’s less fun for our girl than you might think. Summary: A response to redwulf50’s challenge at Elysian Fields. Set between ‘Crush’ and ‘I Was Made to Love You’. Buffy decides that the best way to get rid of the smitten Spike is to give in and date him, since there seems no more sure-fire way of making a guy leave town. A sequel to Borrowed Time. In this version of events Joyce survived, Buffy and Spike had a substantially healthier relationship and his motivation for getting the soul was different, and Tara was not anywhere near the house when shots were fired. Also the Bringers started their potential hunting early and the activation spell was cast over the summer to protect the girls who don’t show up on Council radar. So what happens when the lost potentials start popping up, and what is The First up to? In this installment we meet a new slayer, Spike observes how much changed in his absence, and Buffy dreams. R for now. Eventually NC-17. Response to Shan's challenge 285, wherein Joyce survives but other major S5 events occur. Buffy is ripped from heaven, etc, but will Joyce's presence ease the Slayer's burden? Divergence from canon will be light at first. Some dialog in early chapters will be familiar. Characters not mine, etc. Eventual NC-17 (if my courage holds out), Eventual Character Death(s).